This ergonomically shaped, very comfortable doctor stool is supported by a fife finger base frame on castors. 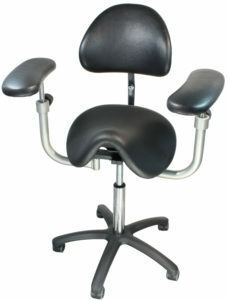 The anatomically shaped saddle seat prevents back fatigue even during extended procedures. The seat tilts approx. 15° forward and backward to dynamically release stress from the spine. Various combinations of arm rests and back rest are available.